In 1972, Indiana State University president Alan Rankin and other administrative officers issued a report titled “The President’s Commission on the Status of Faculty Women at Indiana State University.” The contents of this document describe at length the lack of care provided for women faculty and what actions against this the University planned to take. This report came at a time of great social change for women and was a report easily acceptable and presentable to Indiana State University. This report also came one hundred years after the creation of Indiana State Normal School, a time when such a report would have been a mockery. During its early years, the school’s number of women was not high and hiring practices that favored men and not women were often overlooked. It is also true, however, that many of the women who taught history in the early years of ISNS were nevertheless able to overcome these adversities and become influential personages at the school, despite the greater perceived popularity of their male colleagues. One of these women was Mary Bruce, who joined the faculty in 1870. Born and raised in Aurora, Illinois and educated at the Oswego Normal School in New York, Bruce had received superb training in the art of teaching prior to her arrival at ISNS. Her first teaching assignment was in the department of History and Geography and many later alumni listings of Mary Bruce note this as her principal area. However, it was only for a short time that Mary taught this subject and she was soon reassigned to teach English and Composition. In this department, Mary became a close confidante of President Jones who took her under her wing with great admiration for her abilities. These two developed a close relationship as fellow scholars and were close friends even outside of academic life. In fact, she even gave President Jones and his wife $1000 for the purchase of a farm in 1873. Applying a great deal of effort in her first few years at ISNS to the production of a pamphlet on the basics of English grammar, Bruce and president Jones worked tirelessly to complete their Lessons in Thinking and in Expressing Thought. Published in Terre Haute and distributed privately to her students, this instructional book on grammar and composition formalized the teaching of the subject for Indiana State Normal School. The work is still available in the Special Collections section of Indiana State’s Cunningham Library. It was referred to numerous times by several grammar professors after Bruce, most notably in an English textbook by Professor Wisely. It was noted that few professors of the time took as much initiative in the development of critical thought for students as did Mary Bruce. Bruce continued these successful teaching methods until she was overcome by illness in 1879 and forced to resign. Her resignation was more than likely due to her illness, but there were also rumors of her dissatisfaction with the intrusions by the next president, George Brown, upon her teaching style during the later years of her tenure. These rumors were corroborated in part by the simultaneous resignations of six other professors. As William Lynch noted in his history of the institution, Brown was fond of the teaching ideas of both Jones and Bruce, but had theories of his own that he wished to implement into the English and Composition curriculum, ultimately successfully, if not also without stiff resistance. In any event, it is just as likely that Bruce’s resignation stemmed largely from illness, considering that she died just a few months after leaving the school in September 1879. Another prominent faculty member of the early years of Indiana State Normal School was Lucy Maynard Salmon. Born in New York City in 1853 to Maria Maynard, a former school teacher, and George Salmon, the young Lucy was instilled with a sense of hard work, determination, and independence. She lived a relatively simple life at home, helping her mother maintain the house and learning the art of home economics. Lucy was influenced to move beyond the domain of domesticity in her life, perhaps jealous of her brother Pomeroy’s greater prospects as a male. As her natural talents for history became increasingly evident, she decided to pursue a career in the field, with her family’s blessing. When Salmon was ready to leave home to acquire advanced training, she chose to attend the University of Michigan. This school was one of the most liberal in the nation at the time and this was partly what attracted her to it. During her studies she became a superior student of history with a profound interest in the subject of women. While in Ann Arbor, she had several opportunities to speak out against what she believed were injustices against women. She carried these lessons with her after graduation when she was suddenly faced with the daunting task of finding a job that would support her—and this in a depressed American economy following the panic of 1873. She finally found a position as a high school teacher in McGregor, Iowa, in spite of discriminatory hiring practices. Once there, however, Salmon found the job troubling because of the amount of disciplinary action she was forced to take against the male students who often blatantly challenged her authority. Nevertheless, she eventually became the principal of the high school, resigning the post in 1882. In 1883 she returned to the University of Michigan to compose a Master’s thesis under the supervision of Professor Charles K. Adams. Not long after its completion, she was recommended for a history professorship at Indiana State Normal School. Though initially hesitant, the prospect of teaching history was far too alluring not to accept. That being said, Salmon was skeptical that she had much of an influential role in the faculty and was even critical of the school itself for its tendency to “put the cart before the horse.” But despite these reservations, Salmon went to work and won respect in the department for her well-structured explanations of the nature of historiography. Most of Salmon’s time at ISNS, however, was either spent working with other organizations or on leave doing further graduate study—the latter at Bryn Mawr from 1886-1887. 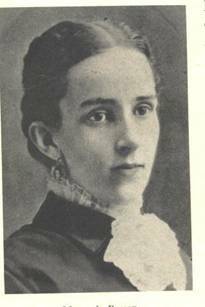 In 1884, she became the first person from Indiana to join the newly formed American Historical Association and one year later she had the opportunity to present part of her thesis before one of its meetings. Entitled “The History of the Appointing Power of the President,” the paper was of great interest to contemporary proponents of civil service reform such as George W. Curtis. 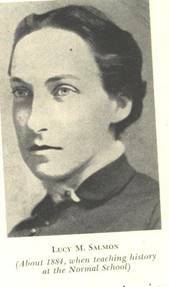 She left Indiana State Normal School in 1887 after only four short years and began a history professorship at Vassar College. It was here that she became one of the nation’s most renowned female historians, and gained special recognition through her appointment in 1896 to the American Historical Association’s “Committee of Seven,” which was given the charge of advocating for history’s place within the American school curriculum. Her students there admired her immensely and continued to praise her work and determination over the next thirty years. Then in 1927, while sitting pensively at her desk, Lucy Salmon died of a stroke. She was seventy-four years old. Many other influential female professors of history passed through ISNS after Mary Bruce and Lucy Salmon, even if many of them, too, eventually spent their careers elsewhere. These include Agnes Rounds, who taught history in 1886; Gladys McClung, who taught European history in 1917; and Maria Jacobs, who taught History of Education from 1921-1922. Their reasons for leaving are vague at best, which may cause one to wonder as to the nature of the hiring and treatment of women in the early years of the institution. Considering the knowledge and skill level of Mary Bruce and Lucy Salmon, it is hard to believe that there were not more women like them and even harder to believe that they could be so utterly overshadowed by their male counterparts. With this background in mind, the tenor of the 1972 report on the status of faculty women may be all the more understandable, as it provides a new perspective as well as giving a new perspective on the history of women not only at Indiana State, but in academia as a whole. Allen, Max P. History of the Indiana State Teachers College. Thesis, ISU, 1930. George Brown File, Indiana State University Archives, Terre Haute, Indiana. Mary Bruce File, Indiana State University Archives, Terre Haute, Indiana. Orrill, Robert and Linn Shapiro. “From Bold Beginnings to an Uncertain Future: The Discipline of History and History Education.” American Historical Review 110 (2005): 727-51. Salmon, Lucy. Historical Material. New York: Oxford University Press, 1933. ________. Why is History Rewritten? New York: Oxford University Press, 1929. William Jones File, Indiana State University Archives, Terre Haute, Indiana.